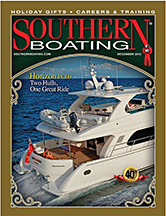 In the December SOUTHERN BOATING, an article about the San Bernard, written by Mike Holmes, was featured in the West Gulf Coast Report of the magazine. "Reborn San Bernard River Flourishes"
The smallest parade I will be highlighting takes place on one of the most interesting stretches of water on the Gulf Coast – the San Bernard River. The San Bernard begins life as an underground spring which comes to the surface just south of the small community of New Ulm, Texas. From there is flows – sometimes – 120 miles or so to the Gulf south of Freeport. I say, “sometimes”, because the San Bernard has had it’s problems. Many years ago, the Corps of Engineers decided to close off the natural outlet of the Brazos River a few miles inland to make the Freeport Harbor, and jettied the entrance channel that had once been the river’s mouth. An outlet canal was created to divert the flow of the Brazos south of Freeport a bit. All of these outlets - new and old Brazos and San Bernard – are connected and bisected by the ICW. As they say, it is sometimes not nice to mess with Mother Nature, and the San Bernard bore the brunt of the consequences. Sand from the beaches around Surfside, Texas, begin eroding from unnatural currents caused by the jetties, washing west on the flow of the “New” Brazos outlet, and most of this sand eventually ended up in the mouth of the San Bernard. As far back as 2002 the river mouth was pretty much closed, although localized flooding would sometimes open it a bit. By 2007, it was a done deal, with a broad sand beach across what used to be the mouth, and people in Surfside wanting it back! A group of concerned citizens, aided by Congressman Ron Paul, worked for years to finally get funding approved to re-open the river, and dredging on that project was completed in 2009. Unfortunately, the forces that closed the river are still at work, so it has been sanding in again. Mike Goodson of the group Save The River San Bernard tells me that as of October it is still flowing into the Gulf, but the main channel is only maybe 3-4 feet in depth. Sadly, I remember running offshore through the San Bernard in the late 1970’s, and the river was once home to a fairly large fleet of shrimp boats. The good news is the San Bernard is a small but beautiful river that is mostly brackish and home to fish species such as speckled trout and redfish. Boating and water skiing are very popular, riverfront property is lovely and expensive, and there is an exceptional restaurant – Dido’s – on the river just north of the FM 2611 bridge. Friends of the River San Bernard (sanbernardriver.com) sponsor a Christmas boat parade on the lower river for mostly trailerable boats that begins at the FM 521 bridge near Brazoria and runs to the FM 2611 bridge at Churchill starting at dusk on December 8.